Detail of roofing in interior of the Mahabodhi Temple, Bodh Gaya. bl.uk > Online Gallery Home	> Online exhibitions	> Asia, Pacific and Africa Collections	> Detail of roofing in interior of the Mahabodhi Temple, Bodh Gaya. Photograph of the roof of the interior of the Mahabodhi Temple at Bodh Gaya, before repairs, from the Archaeological Survey of India Collections, taken by Henry Bailey Wade Garrick in 1880-81. The Mahabodi Temple complex is one of the holiest sites related to the life of Buddha as it is the place where he attained Enlightenment. The present temple dates from the 7th Century and later and was built on the site of a previous temple erected by Emperor Ashoka in the 3rd century BC. It is built in front of the Bodhi Tree, the tree under which the Buddha obtained enlightenment, surrounded by a quadrangular stone railing. The temple is also the sole survivor of the monumental brick traditions in eastern India. Repairs and restoration of the temple were undertaken by J.D. Beglar, an appointment authorised by Sir Ashley Eden, Lieutenant-Governor of Bengal, in 1880. Alexander Cunningham and H.B.W. 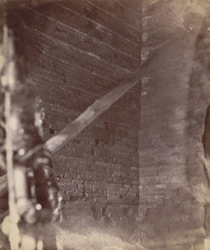 Garrick, Report of tours in North and South Bihar, in 1880-81 wrote, "On examining the great temple, my attention was drawn to the peculiar method by which the uppermost chamber is roofed in, and I wished to take a photograph which would give an idea of this strange and rare example of corbelling work. There is but little light in this chamber, only what is admitted through the irregular opening to the east, besides which there are a number of supprting jambs, propping up the vault, which appears to be rather unsafe...these jambs also obstruct the view in a great measure. However, by inverting the apparatus [ie camera] on the scaffolding, I managed to secure a memorandum of this rather interesting architectural detail of a by-gone time..." (A.S.I. vol. XVI, Calcutta, 1883).